I didn't expect to learn much from my fourth (or possibly fifth...?) reread of volume eight of The Sandman, World's End. 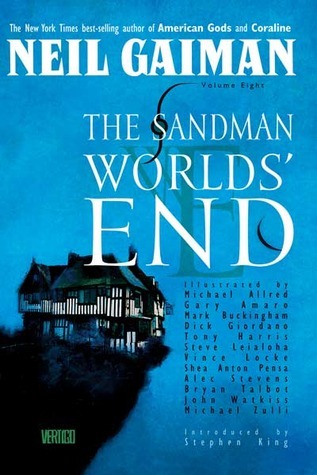 I pulled it off the shelf to pass a few hours pleasantly, recalling that though World's End is rarely ranked among readers' top-favorite Sandman volumes, it remains the book I cherish most out of the series. When I think to recommend The Sandman to readers, I have to overcome two major hurdles: the first is that The Sandman is in graphic novel (comic) format. The second is that The Sandman requires patience. Lots of patience. It's a series that starts out strong, fizzles a bit, flares, fizzles back, and then rises in one of the grandest story progressions I've read in my entire life (books six through nine are simply splendid, while ten has its moments of pure brilliance with a somewhat quiet, unsatisfactory ending). It is no surprise then, with this wondrous crescendo that I find it difficult to name my favorite volume, but there it is: volume eight, World's End. The thing about The Sandman that I'm realizing as the years go by is that it's incredibly subtle. I'm not talking subtle like The Tiger's Wife (a book in which the vagueness provides an aura of subtle storytelling), but rather subtle like, Neil Gaiman leaves clues hanging around and if you pick up on it, good job! If you don't... alright! We're talking subtlety on a level unlike anything else I've ever read, some of it on a fairly obvious level (would that make it not subtle...?) and some on a level seemingly so obscure and unclear that even The Great and All-Knowing Internet hasn't provided me with any answers. World's End is the key to almost all of The Sandman's subtlety. Or the portal. World's End includes within its pages a wide and diverse cast of characters - some returning, others new - but the entire premise is built on the notion of storytelling. Not only is World's End a story-within-a-story-within-a-story, it's convincing. Returning characters do not suffer from reintroducing, casual mentions of older stories or references are lightly done, and the story builds carefully to what is doubtless the most beautiful and poignant Sandman ending yet. There is foreshadowing - oh yes - but like everything else, a reread reveals that it's hidden within the least suspicious stories. And so by rereading World's End I have learned much. A story that had never meant much to me (other than having a lovely two-page spread) suddenly took on secondary meaning (and had me wondering if Gaiman had slipped in a romance story without my noticing), a scene that upon first reading meant little retained its enchanting relevance (discovered upon the first reread), and I was still blown away by the way the small, seemingly insignificant stories tied into the greater Sandman world. Whatever drama volume nine may have, whatever excellent character development volume seven may house... it's the smaller, quieter World's End that astounds me again and again and again. So if you've read (and enjoyed) The Sandman, reread it. Now. There's so much more to be found within its pages, so many subtexts and quieter truths that do not immediately present themselves upon reading. Go back and reread World's End. Enjoy its storytelling, enjoy its message, enjoy the way it ties the series together. And if you haven't read The Sandman, start at the beginning. But remember: patience. Not everything reveals itself right away. And one final thing: this can be a wonderful experience. Oh my. I have to say that I have been tempted by this series before, but never like this, and now I feel like I must try to read these books. I love subtlety and nuance, and it sounds like this book has shades and shades of it. This was one of the most intoxicating reviews I have ever had the pleasure of reading. Thank you for that. I always reread the Sandman. It's wondrous. There are stories I often skip, though, and one of these days I need to do the thing properly: start from the beginning, go on to the end, then stop. I think it would be neat to experience it the same way that I did when I was first reading it.